No, not as in, located in your grocer’s deli-section or sandwiched between Wonder Bread with lettuce, tomatoes & mayo. Not as in, synonymous with Guilty Pleasures. Not even as in, I wish my husband/wife/life partner/child/dog lit up at the sight of me the way she/he does at the smell of frying bacon. 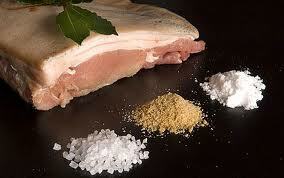 I want to be like bacon, as in, cured. I want a life free of multiple sclerosis. I want a world free of multiple sclerosis. 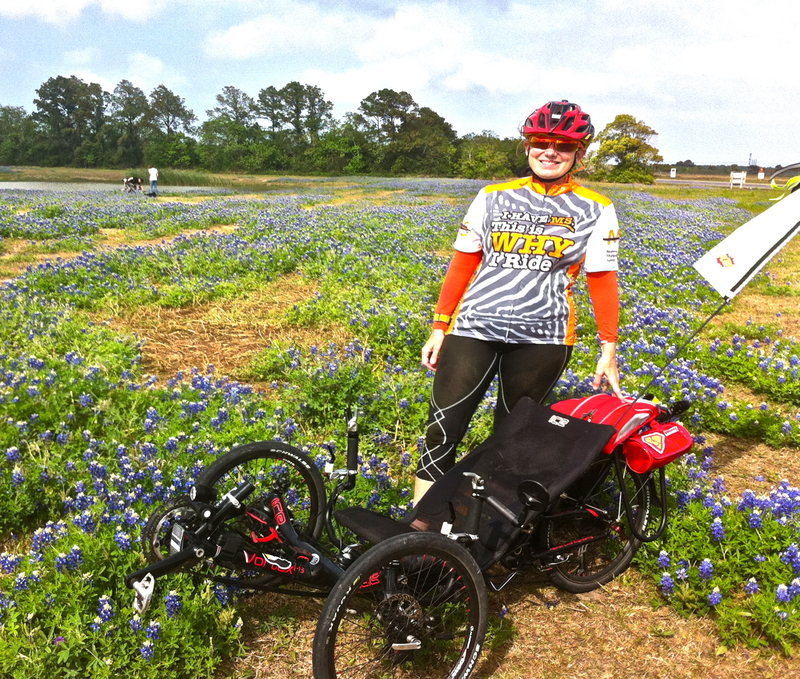 I get asked a lot – by folks I don’t know at all to people I know well – why someone who has MS would put herself through the training involved for a demanding endurance ride like the MS 150. I have a lot of reasons, of course, but the one I’ve never actually said to anyone, is that I ride because I want to be cured. As in: Relieved Healed Mended Remedied Restored. I want – as one dictionary definition says so simply & beautifully – to be made whole & right. Okay, okay, truth be told, it would take a lot more than removing MS from this brain & body to make me “right.” But, hey, it’d be a really good start. I know you can’t see it very well in this photo, but my jersey says “I have MS. This is why I ride!” And the red weird-shaped blob-ette on the bottom part of my trike’s flag says “POW.” Which helps me channel my (mostly inner) super(pedaling)powers. I ride because, as long as I’m able, it’s the best way I know of putting all of my desire & hope, belief & faith, commitment, dedication & devotion into ACTION. Riding in BIKE MS events like the BP MS 150 is my whatever-it-takes, give-until-it-hurts, No Opportunity Wasted epitome of throwing every single ounce of power I have toward becoming cured. Toward finding a cure for everyone whose lives are – or will be – touched by multiple sclerosis. I ride because I can. And when I say “because I can,” I should say because I can Again. I had to give up cycling years ago because of MS-related balance issues. And because I didn’t know about the existence of recumbent trikes. The design of which gives me back the ability to ride. Three wheels = No need to balance! I should also say, Because I can right now, and there’s no way – with a disease like multiple sclerosis – to know how long Can and Now might last. I ride because I love cycling only slightly-less than the way most people love breathing, eating, sleeping, shelter and their kids. And because when I lost riding from my life for over a decade I missed it as if missing it had sharp, jagged edges, that didn’t dull with time. I ride because I want to see my cycling friends with MS, like Derek Chalmers & Lisa Baker, ride without the challenges of MS. And because I want them to keep riding (and riding, and riding). I ride because I want my writer friend T. to know what it’s like to engage in her poetry (& mothering, & every other aspect of life) without all of the complications that MS offers up on a daily basis. I ride because I want my dear friends Lisa & Lee – who have been there for me since the crazy-making, seemingly-never-ending process of diagnosis – to be able to move through this world comfortably, free of fatigue & pain, balance problems or vision issues. I want them to be able to pursue & indulge in their loves – cooking & writing, drawing & walking beaches with dogs, traveling, dancing, singing – without ever having to take the limits or “add-ons” of MS into consideration. I want them to never again have the experience of factoring all that comes with a life of illness & disability into a job or friendship or love affair or day off or deep desire to launch into anything. I want for them the enduring strength & energy, the made-new wholeness & confidence, the no-limits faith & daring of a nothing-but-blessed, robust, health-flowing-over life; the faith & freedom to commit to new journeys of learning, communing, exploring, creating & celebrating – without worrying about What-Ifs. I ride because I want my friends & family, and most of all my beloved Gary, to be able to let go of the burden of constant-vigilance, to be loosed from the tether of always-worrying. And I want the same for all of those whose love for someone with MS also means time & energy – basically whenever they’re awake – attached to concern. I ride because I want & need to make a difference. I ride so that others may know that they, too, are capable of making a difference. I ride to raise awareness & funds for other worthy causes, for other things that need to be changed, for other people I love & desperately want to enjoy a “cured” life. I ride because – yes! – I want to know “bacon-ness,” myself. I want to know that I moved the engine of my – and others’ – cures that much closer with my hard-to-come-by efforts, my sweaty-ouchy-sometimes-whiney-&-cursey but-nonetheless sparkly-&-triumphant WonkyBent (super)power of pedaling. It’s also quite-fair, I think, to say that I ride because Phil Keoghan leaves me no other choice. First, he rode cross-country for me. Then he shared with me his super-secret superpower – the darned-near-impossible-to-ignore, life-transforming gift of the No Opportunity Wasted philosophy. Which goaded taunted coaxed dared inspired me to dream grander than I’d ever dared. And what’s worse more, he refused to let me off the hook. You know, that hook that says we are – each of us – responsible for taking the action necessary to manifest our dreams. Lastly, he infected me with the belief that I was capable of all of those “necessary actions” in spite of a little something like multiple sclerosis. And, wonder of wonders, it turns out he was right: I did have what it takes. I rode my way to a dream come true. And now I have to keep riding. I have to ride all the way to a cure. After all the trouble he’s caused that, it’s really a wonder I’m still talking to Phil Keoghan, right? Any more Phil-Influence and I just might attempt flight, moon-walking or brain surgery! I mean, I would talk to Phil. Like, if he were to, you know, call me up. What? It could happen. No, really, Phil & I are tight have met. We’ve ridden miles on top of miles a single mile in one another’s company in a group of ten thousand riders. And he knows from our many, long conversations the couple of brief exchanges we’ve shared during a meet-&-greet for Together In MS – one of which was right before the Bike MS Coastal Challenge – how much I blame him I’m thankful for the ways in which he has, and just will not quit! continues, to inspire me. And I think the feelings are mutual! I’m pretty sure he feels exactly the same way about me as I do about bacon him. Okay, okay, that last part isn’t exactly-true. As in, like, never. My friendship with Phil Keoghan & his Tiger-Mother-esque ever-abiding, undying encouragement of my goals & dreams aside, I’d love it if all of you would help me in the process of my bacon-transformation – my journey of riding to a cure for MS, one BIKE MS at a time. You may do so by sending words of support, by showing up to Woohoo! for me along the route when I ride – or better yet – coming to ride with me. And, of course, you can super-speed my crispy-but-not-burned just-right bacon-cured-ness by donating to my Lone Star BP MS 150 ride next weekend: right HERE. You can also wear ORANGE for MS-awareness. You can Tweet & Post & Pin & Link to this blog post. You can volunteer at your local MS Society and/or any Walk MS or Bike MS event. 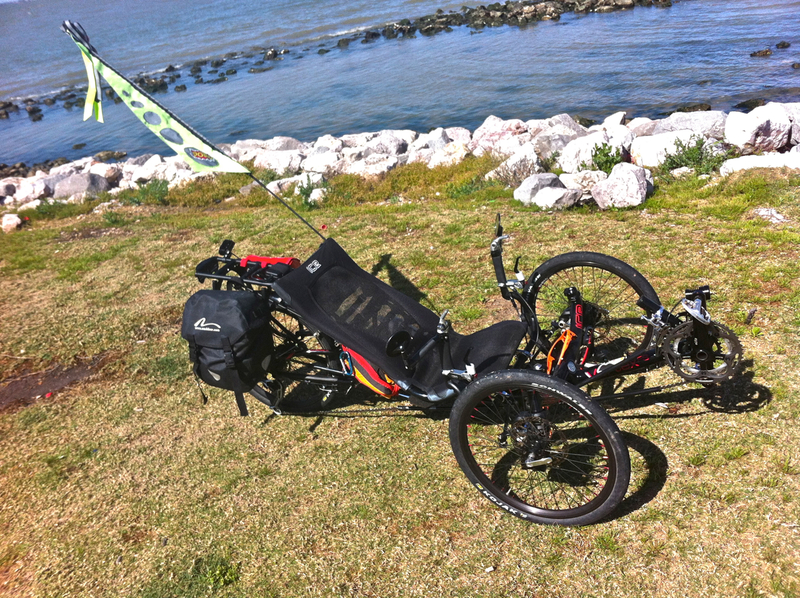 You can create a conversation about multiple sclerosis – and don’t forget to mention recumbent trikes! – with co-workers, friends & family, strangers in line at Starbucks or Target or the DMV. Are you an artist? You can craft a character or story-line involving MS. You might cast an actor who has MS; you might hire someone who has MS to be your lawyer, nanny, graphic designer or personal assistant; you might recommend someone with MS for a job or grant or blind date. You might take someone who has a loved one with MS out for coffee, or a beer, or – oh, I can’t help myself! – bacon. Do you have the soul of an activist? You can write to politicians, newspapers, talk shows, schools, community centers, the medical community. Contact the National MS Society for ways to raise your voice & make a difference. You – yes, all of you – have the super(power) to baconize CURE MS!!! 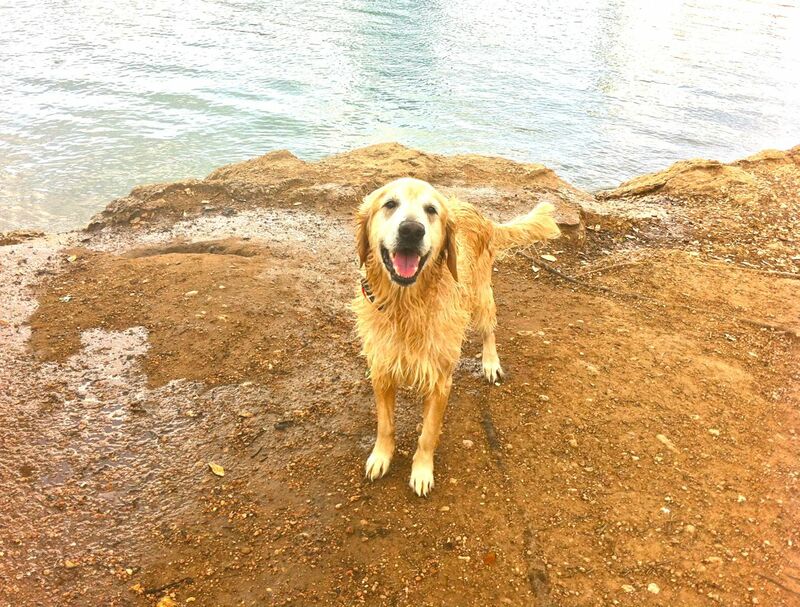 Oh, and speaking of bacon, I thought I should post a pic of my service dog Luke. You know, since he’s bacon’s Numero Uno Fan. Luke’s also a big fan of that Phil Keoghan guy; you should’ve seen how they ganged up against me got along! Oh, wait. You can: HERE.